“In the Jewish eschatology—of Babylonian origin—Behemoth and Leviathan designate two monsters, Behemoth ruling the land (the desert), Leviathan the sea, the first male, the second female. The land animals venerate Behemoth, the sea animals Leviathan, as their masters. Both are monsters of the Chaos. 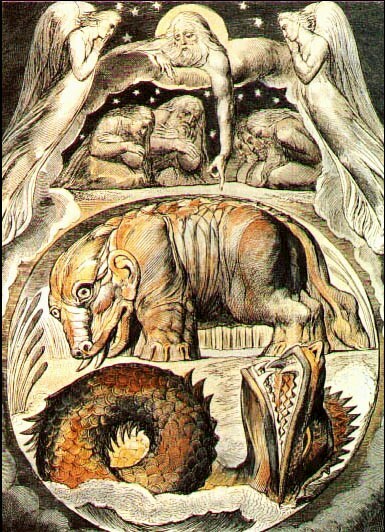 According to the apocalyptic writings, Behemoth and Leviathan will reappear shortly before the end of the world. They will establish a rule of terror—but will be destroyed by God. In other versions Behemoth and Leviathan will fight each other incessantly, and finally will destroy each other. The day of the righteous and just will then come. They will eat the meat of both monsters in a feast which announces the advent of a realm of God. Jewish eschatology, the Book of Job, the prophets, the apocryphal writings are full of references to this myth, which is often differently interpreted and often adapted to political circumstances. St. Augustine saw in the Behemoth the Satan. It was Hobbes who made both the Leviathan and the Behemoth popular. His Leviathan is the analysis of a state, that is a political system of coercion in which vestiges of the rule of law and of individual rights are still preserved. His Behemoth, or the Long Parliament, however, discussing the English civil war of the seventeenth century, depicts a non-state, a chaos, a situation of lawlessness, disorder, and anarchy. —-”Note on the Name Behemoth” from Franz Neumann, Behemoth: The Structure and Practice of National Socialism 1933-1944, New York: Oxford University Press, 1942,1944.